Search Leeds is only in its second year and it’s already needed a venue upgrade to the world class Leeds Arena. With three tracks of talks across the day there was a lot to take in and a lot to digest. We’ve tried to distil the most important insights of the day into a condensed list. Given the exemplary calibre of the speakers, the amount of speakers presenting and the amount we can still discern from our fevered, caffeine-fuelled note taking, we can’t quite do it the justice it deserves! Great campaigns use emotions to make content shareable – remember the old media adage ‘if it bleeds it leads’. It’s not all about the $$$ – pure spend alone won’t get the same results. Always ask: Why do people buy x? And ask: ‘Why is it important to us?’ three times. Really drill down into the root of the emotion behind the campaign. Add friendly stalking to your outreach. E.g – outreach to a journalist, then later run your content using Facebook ads targeted to job type ‘journalist’. Update old data sets – this is great for lower budgets. Take previous years’ content and plug new data in. 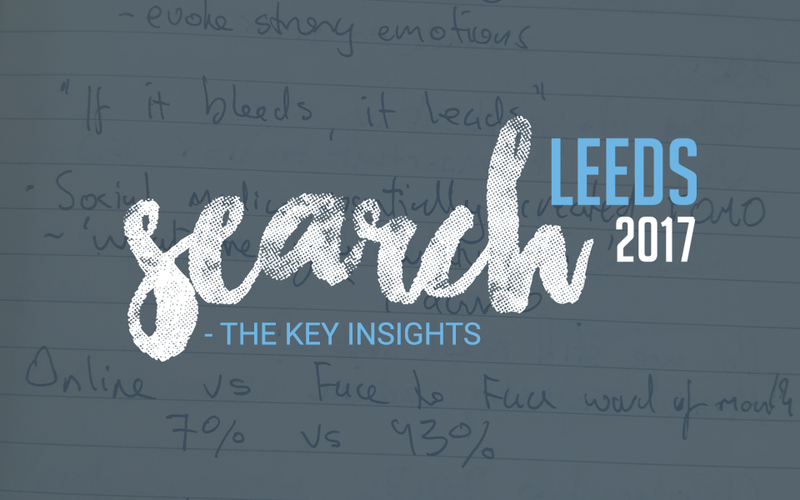 Thank you so much to the whole Search Leeds crew, the fantastic Leeds Arena team and of course all the speakers for putting on a fantastic event (and to SEMrush for some delicious cookies). We can’t wait for next year already; but first we need to fill our task backlogs with all these amazing ideas.